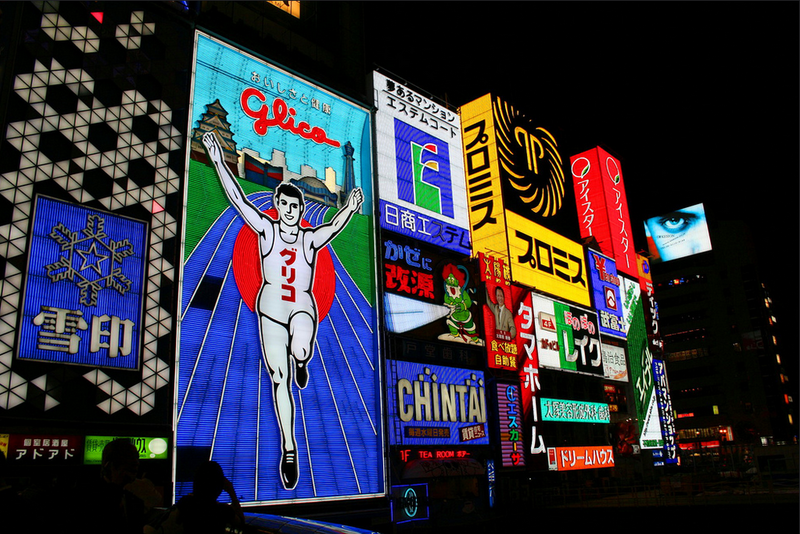 Osaka is Japan’s good-time city. A frenzy of neon lights and greasy street food, easy-come beer and all night parties, world-class shopping and boisterous locals. It’s everything a metropolis should be and more – alluring, enticing, overwhelming, gritty, vibrant, tough, mysterious… and that’s just the love hotels. Even better, for all you foodies it’s practically heaven on earth. Join Japan Centre as we take a look at our Top 5 Osaka Eats. Who said Japanese food was always healthy? 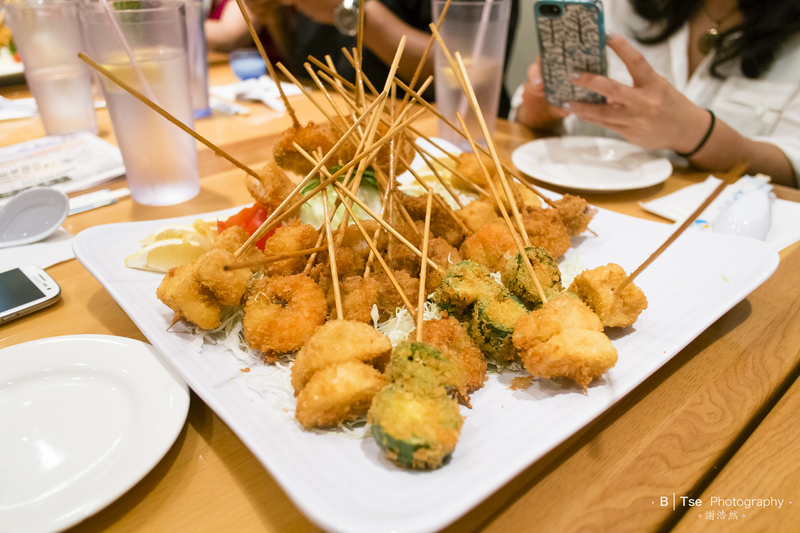 These skewered, deep fried sticks of sin can be picked up on the street, ordered at izakaya or even fried up in front of you at special kushiage restaurants. Consisting of meat and veg submerged in batter and fried, they’re a particularly popular snack when watching the home team playing baseball – the city’s favourite sport. One of Osaka’s most famous sights is the hulking, mechanical crab, splayed out on the wall of neon bedecked Dotonburi. It’s the symbol of Kanidouraku Dotombori-Honten, a touristy but fun restaurant that serves up crab in multiple manifestations, including crab sushi and grilled crab legs. 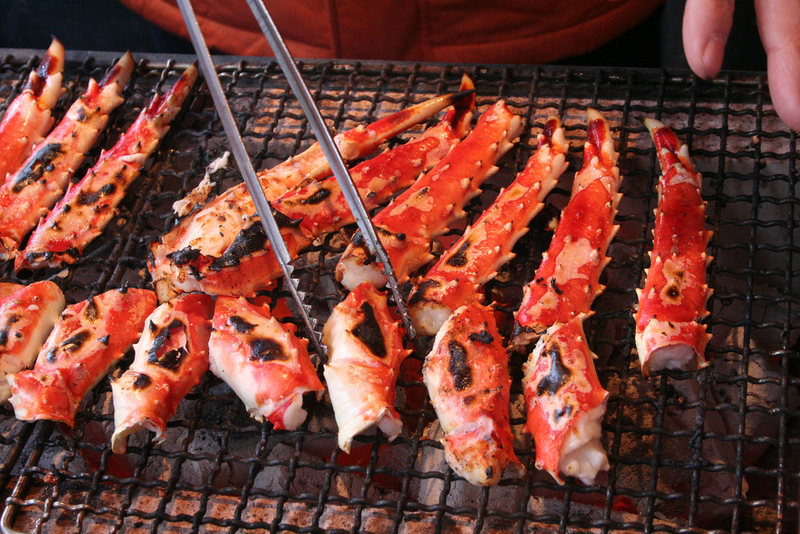 Grab a crabby snack from the outside yatai stand and wander through the electric wonderland of Dotonburi in awe. 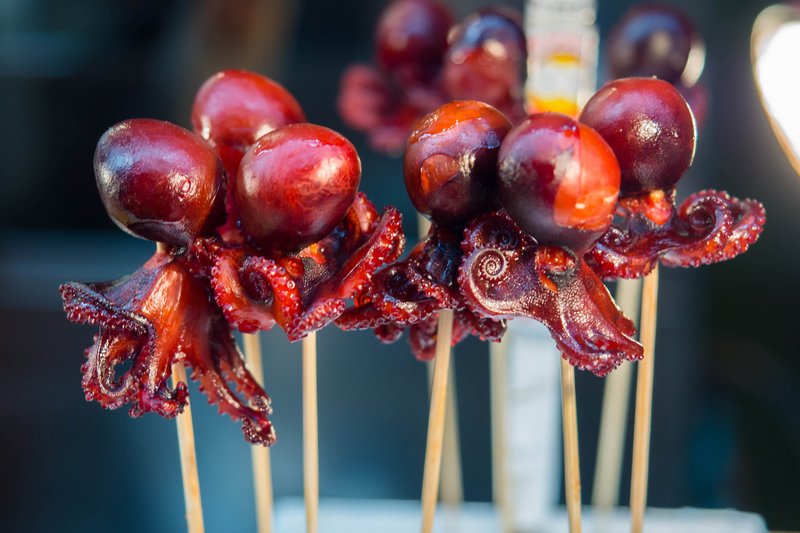 Perhaps one of the more eccentric street food snacks you’ll encounter in Japan (/the world), Tako Tamago consists of a quail egg stuffed into the head of a little glazed, grilled octopus, which is then impaled on a skewer. Sound tempting? Pick one up from the awesome Kuromon Ichiba Market which is packed with fresh seafood and tempting street food. An absolutely essential Osaka experience is getting stuck into Okonomiyaki. Typically made with batter, cabbage, meat and special toppings, in Osaka you’ll find an astounding range of varieties including kimchi and cheese, seafood and even mochi. Washing it all down with an ice cold beer is obligatory. 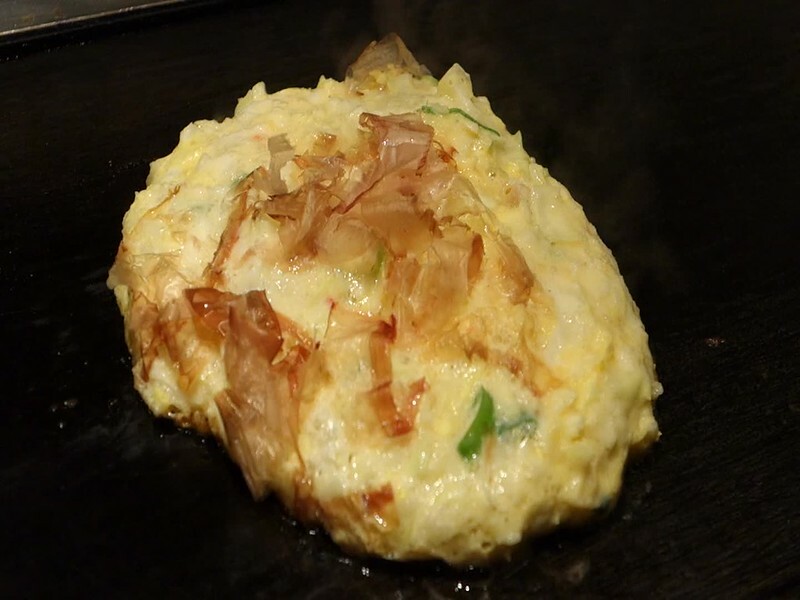 Try our recipe for Osaka style Okonomiyaki. 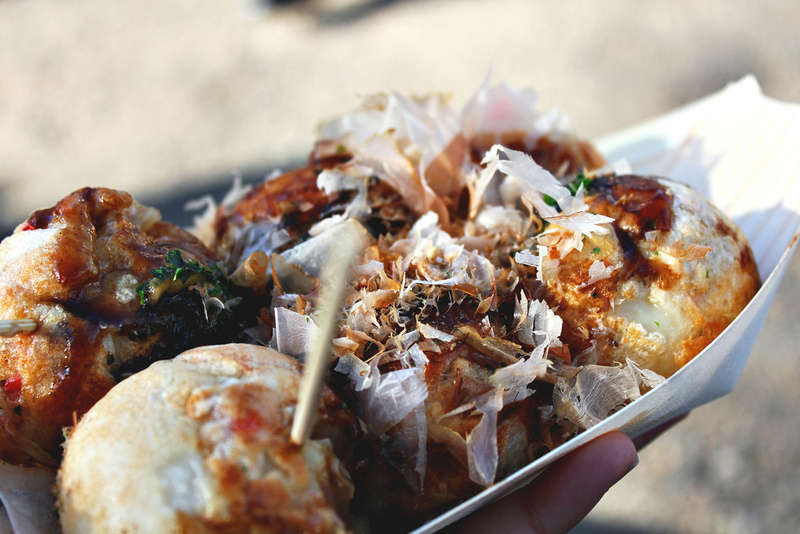 The spherical king of Japanese street food has to be the almighty takoyaki ball, a savoury dumpling made with diced octopus and batter in a special platter, finished off with sauces, bonito fish flakes and nori seaweed. Ubiquitous throughout the city, takoyaki stalls are constantly on standby to serve up a portion in no time. One of the more unique places to try them is in the gigantic Spa World, where you can take a break from naked bathing en masse to relax in pyjamas and snack on takoyaki – a true ‘only in Osaka’ experience. Have we forgotten any of your Osaka street food favourites? Let us know in the comments below, or via Facebook, Twitter and Instagram. Posted in Travel and tagged explore Japan, kushiage, okonomiyaki, Osaka, Osaka street food, street food, Tako Tamago, Takoyaki, Top 5, Top 5 Japan. Bookmark the permalink. Hey, what happened to the logo competition? ?